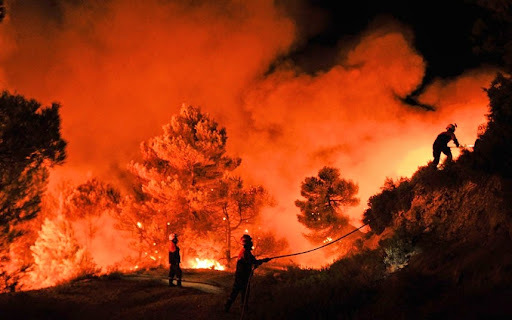 100 people plus who evacuated their homes as a fire swept across Mijas Costa on the Costa del Sol started to return in the early hours as the blaze was finally brought under control. The bush fire that started in the El Chaparral district of Mijas Costa was fought by 12 aircraft and firefighters from towns all along the Costa del Sol. The blaze, first spotted around 7.30pm yesterday (Friday) rapidly spread, fanned by strong winds. Mijas council opened the La Cala sports centre as an emergency shelter for those fleeing the flames. By 8pm the fire around the original hotspot at El Chaparral was under control, but it was spreading quickly from a new hotspot towards the Cerrado de Aguila golf course and urbanisation. It had spread past the lush fairways of El Chaparral golf which may have helped protect the homes on the nearby urbanisation. A firebreak was bulldozed near a secondary school – the flames had come to within 100m of it and were perilously close to a Eucalyptus wood just over the road from the CEIP El Chaparral. INFOCA (forest fire control service) said there were three hotspots, the main one being at El Chaparral, another at nearby La Roza and the third near the hipodromo horse racing track. The integrated fire plan was put into action to fight the fire, with police and civil protection volunteers blocking off roads while Mijas council water tankers accompanied fireengines from Mijas, Benalmadena, Torremolinos, Fuengirola Manilva and Marbella as they followed narrow urbanisation roads to tackle hotspots and protect property. Firefighters worked through the night to put the fire out. Twenty five INFOCA firefighters were remaining on the scene today to dampen down and control any fresh outbreaks.